Need alternatives to Time Out”? We have ’em! 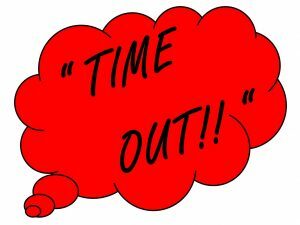 Do you sometimes feel like “time out” just isn’t working? You keep putting your child in time out, and she keeps doing the same thing over and over. Wondering what you can do instead of “time out” to teach your child the differences between right and wrong? There are alternatives! Here are some you can utilize during your next meltdown! Describing Feelings. Sometimes just helping her describe her feelings helps. Children act out and do things they shouldn’t because they are frustrated and unable to describe what they are feeling. Acknowledging their feelings and giving them a name for their feelings can help them to feel less frustrated. Instead of jumping in and telling them they need to apologize and yelling at them that they can’t do that, stop and acknowledge that they are frustrated, angry or sad and explain to them that it is okay to feel that way that they just can’t behave in that way. This helps them to understand their feelings. Express Feelings in a New Way. Teaching her a different way to express her feelings is another way to help her. Once you’ve helped your child describe her feelings it’s time to help her deal with them in a more constructive manner. If your child is hitting because she is angry that someone has taken her toy away, acknowledge that she is angry and give an alternative to hitting you or someone else. Tell her, “I know you are angry that your toy was taken away from you, but I can’t let you hit someone. Try hitting this pillow instead.” Make sure you let your child know that you still love them and that she hasn’t lost your approval. There are more acceptable ways to express your anger than hitting someone. Tune into Feelings. Teaching a child to tune into their feelings instead of just offering praise when they do something good is another alternative to time out. Prevent the behavior before it begins. “How did it feel when you helped pick up your toys?” This helps her to start thinking about her feelings and stay in touch with those feelings. If children are more in touch with their feelings they are less likely to act out. Stay and Listen. Stay and listen to them when they are really upset. When a child is very upset they are not going to understand or listen to reasons they shouldn’t behave a certain way. They are not going to understand why they are in time out. They just know that they are upset. Let them know that you are there. Rub their back, if they don’t mind the touch, and just sit and listen to them. Do not push them and expect them to get over it quickly, just sit with them until they are calm. This will let them know that you are there for them no matter what and that you love them always. It also lets them know that you can handle their emotions. Many times children misbehave because they don’t understand their feelings or ways to express those feelings. Helping them understand their feelings and way to express them safely is a great alternative to time outs and prevents the bad behavior in the long run. So I encourage you to try out the new tactics and just see how they do!